There was much hullabaloo when Facebook-owned Instagram introduced Instagram Stories, a feature that allows users to post photos and videos, sometimes embellished with text and illustrations, in a kind of slide show, which automatically disappears after twenty-four hours. Sound familiar? Hum. What is Snapchat…anyone, anyone? So, is this move really a shameless grab or rather, a strategic business decision? 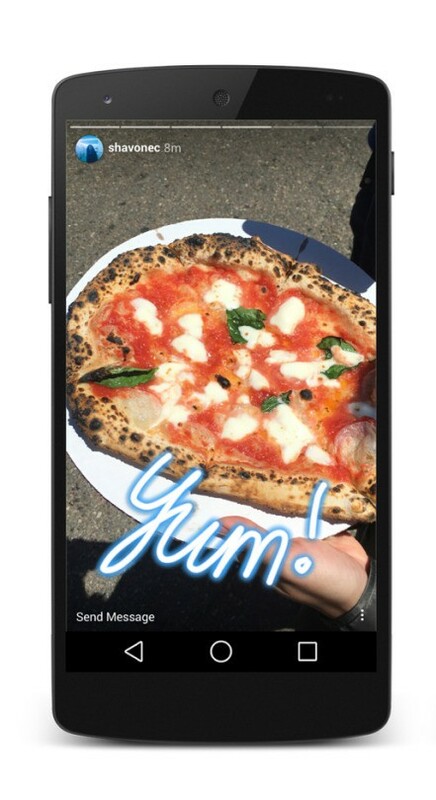 For Facebook, which acquired Instagram in 2012, Stories is part of a concerted strategy. It is a response to demand. How does Snapchat feel about this? Who is going to win the fight? In a first for us at dlvr.it, our blog authors battle it out. 1 – Facebook remains the most-used social media brand among all ages with 64%. But among 12-24’s, it has been overtaken by Snapchat (72% to 68%) with Instagram close behind (66%). What does this mean? Snapchat is the second most powerful social platform in the United States. Facebook (including Messenger) remains the most popular social platform among Americans 12-24 years old, with 32%. But notice in the image below how Facebook’s use has dropped 11% in one year (from 43% in 2015 to 32% in 2016). 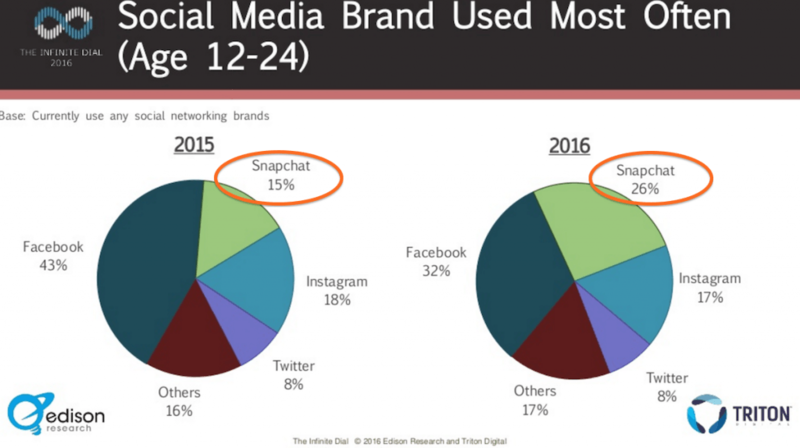 Snapchat is second at 26%, far outpacing Instagram at 17%. Essentially what has happened is that in 12 months, 11% of the entire nation’s population of social media using 12-24 year-olds moved from Facebook to Snapchat as their platform of choice. Wow! Conclusion: Teens are flocking to Snapchat – and thus are increasingly harder to reach on social media. 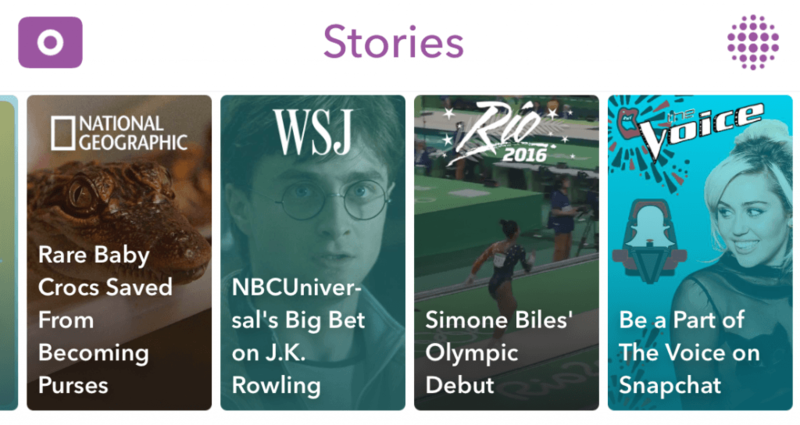 Snapchat describes its Stories as compilations of Snaps (video and pictures) that create a narrative 📖. Stories honor the true nature of storytelling — Snaps appear in chronological order with a beginning, middle and end. In fact, this little feature is a lot more like a personal feed rather than a message. So, with Snapchat you have a couple of ways to communicate. 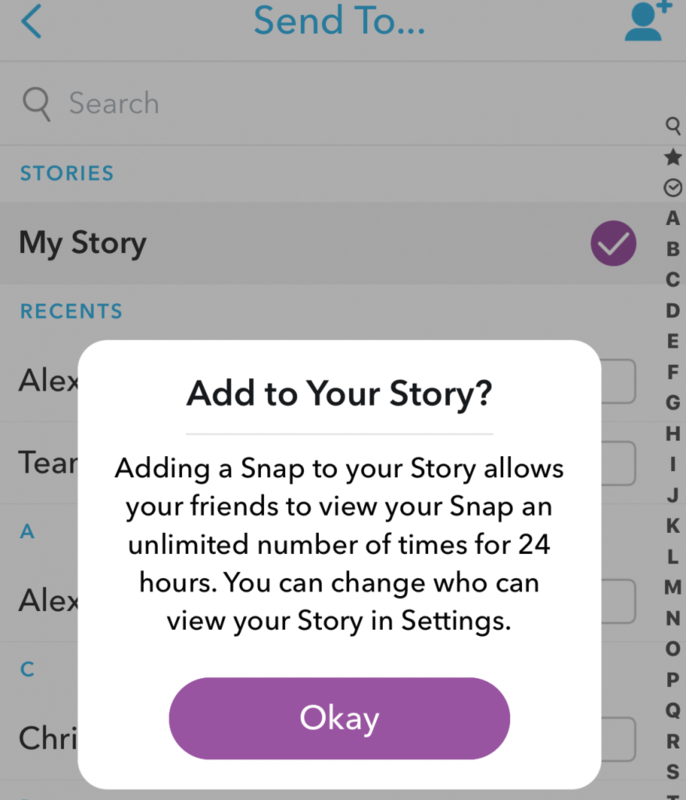 1 – You can send snaps individually to your friends which only last 1-10 seconds depending on the length you choose. 2 – You can post snaps on ‘My Story’ giving your friends access to them for the next 24-hours. 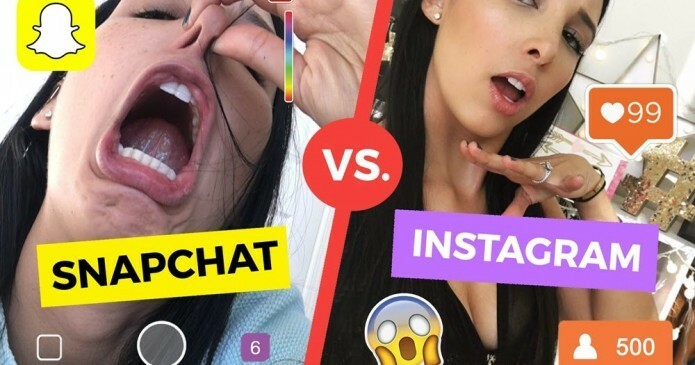 With so many other micro-video and casual photo sharing apps like Instagram, Vine, and others, why would you even want to use Snapchat Stories anyway? The idea is that users can “kind of” tell a story about their entire day in a sequential manner through stories. It’s supposed to be used to give friends a brief look at what interesting, or exciting (or even annoying) things a friend has done in the past 24 hours. And sometimes, a message is so good that it needs to be accessible at least a few more times! People who have large followings can also take advantage of stories. In spite of being a private messaging app, Snapchat Stories offer a more public way of sharing. Lots of celebs, brands, and other high profile users share their Snapchat username manually or by snapcode so that any stories they post can be viewed by the thousands and thousands of users who decide to add them. You’ll notice the content they post on Snapchat isn’t polished: it’s raw and scrappy and fun. After all, Snapchat is all about letting your brand personality shine and relating to your target audience on an entirely human level. On Monday, NBC announced a new five-episode partnership with Snapchat that would allow fans around the world of the live singing competition to show the world just what they can do. Snapchat fans rejoice! 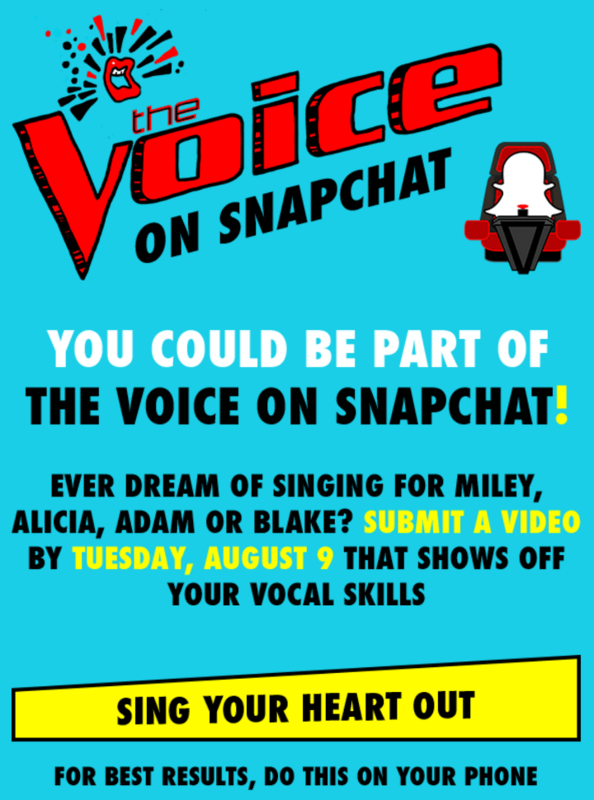 If you’ve ever dreamed of making it onto The Voice, your chance may finally be coming. 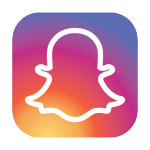 Instagram Stories – a Clone of Snapchat Stories? In its current state, Instagram Stories is a direct clone of Snapchat Stories. Instagram’s reputation to date has been the home of the glamor shot. Celebrities, dueling for supremacy and then their many fans emulating them. Because of the high expectations on photo quality, it’s not unusual for most users to post no more than once a week, or even once a month. In June the average number of Instagram posts per user declined between 2013 and 2015. Contrast that to engagement on the Snapchat app. Consumption of video alone on Snapchat increased 25 percent between February and April, to 10 billion views a day, according to Bloomberg. Instagram now owned by Facebook took notice. Ever since Facebook tried to buy Snapchat (and was rebuked), Facebook has sought to copy the popular photo sharing app but with their unique twist. Facebook shuttered most of these features and service because of the lack of interest from Instagram users. The latest move by Instagram – Instagram Stories, acknowledges Snapchat may have been right all along. Instagram describes its stories product as a way to share your everyday moments including bad hair days. These are photos and videos that don’t meet the higher bar of a traditional Instagram post. But let’s be honest. Stories are designed to get people to share more, period. Like Snapchat, Instagram Stories disappear from the timeline. One important thing to point out is Instagram Stories are in a secondary feed that is available for only 24 hours from the time of posting. However, keep in mind, if you have a particular story you want to share the traditional Instagram feed, you can easily do so by swiping on it and tapping the share button. Snapchat developed a product that allows users to share frequent, candid snapshots of their days without worrying that they’re spamming friends, or leaving behind a public archive of photos that could come back to haunt them later. Instagram has always been about sharing your “best self” with its highly curated feed of filtered photos. Instagram Stories is intended to be frequent and less edited, more of a communication tool. Before we point fingers and accuse Instagram Stories of being a clone, keep in mind – pretty much any photo app allows for uploading content from a camera roll. Just like Facebook set the standard on the social media feed, Snapchat is setting the standard on disappearing photos and images in a slideshow format. It’s not “really copying per se” to add Snapchat-like features in 2016 – it’s the standard for any successful photo app. And Instagram user’s are responding positively to the new feature. How To Use Instagram Stories? You’ll see stories from people you follow in a bar at the top of your feed. The avatars displayed according to an algorithm, attempts to show your favorite accounts first. When there’s something new to see, their profile photo will have a colorful ring around it. Unlike Snapchat, you can tap on the left-hand side of the screen to scroll back to an earlier post. 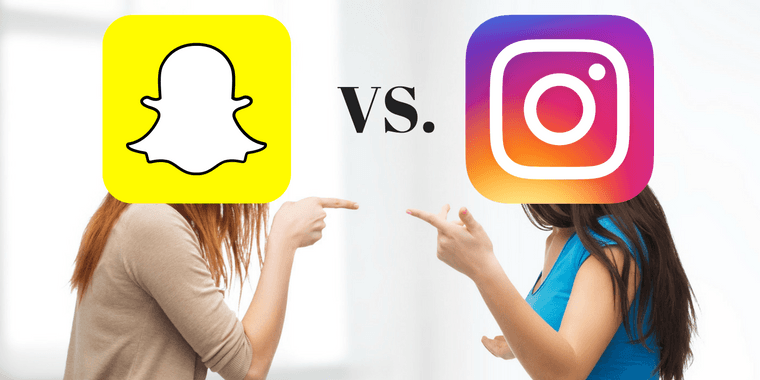 How Instagram Stories Differ from Snapchat Stories? One unique, early advantage that Instagram has over a Snapchat is the ability to limit who sees your Story. Users can easily hide portions of their story (or the whole thing) from any followers who they don’t wish to share with. Your story follows the privacy settings of your account. If you set your account to private, your story is visible only to your followers. However, you can also easily hide your entire story from anyone you don’t want to see it, even if they follow you. When watching your own story, swipe up to check out who is also looking at your photos and videos. You can even choose to feature a particular part of your story by posting it on your profile. It’s reasonable to assume that Instagram will continue to put their own twist on Stories. I believe the naming decision is intentional. It’s a marketing strategy used to instill confidence in their customer base and marketers. They know EXACTLY what this new feature is and how it functions. I think more importantly Instagram needed to create Stories to compete for ad dollars. As we stated earlier, Instagram content has been known to have a high production standard which is challenging and costly to reach. Snapchat’s impromptu nature allows brands to experiment more and be “less perfect”. To compete with Snapchat for video dollars, Instagram had to adjust. 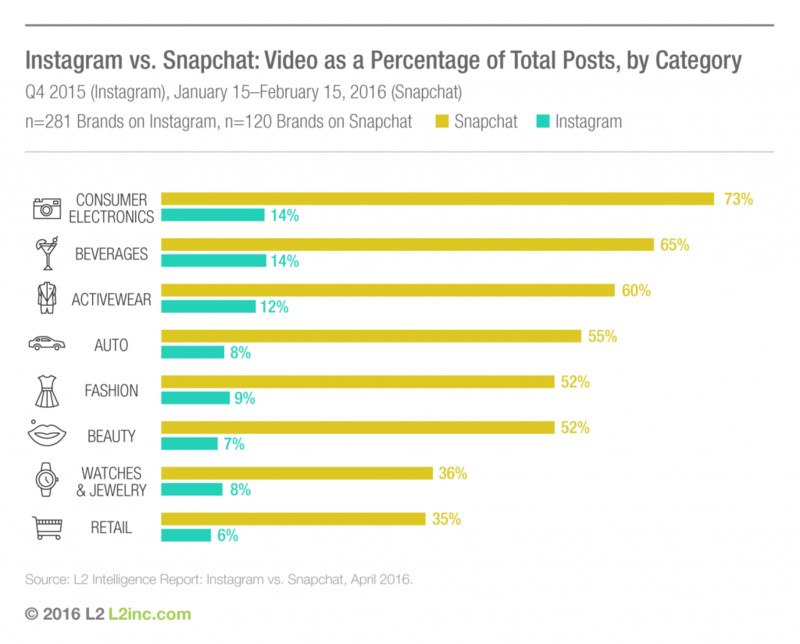 When comparing Snapchat vs. Instagram video usage, Snapchat wins that battle hands down. One complaint marketers have with the Snapchat app is the lack of data analytics. If Instagram wants to win marketing dollars, they would be wise to put resources toward hard statistics about stories as they gain traction with the new feature. Analytics could give them a distinct edge. Given the fact that Facebook is running out of ad space to sell, this seems like a logical step for Instagram. Snapchat appeals to a younger audience. Sixty percent is aged 13-24. Snapchat claims it reaches 41% of all 18 to 34-year-olds in the United States on any given day. Instagram reaches a broader more mature section of the market. Forty-six percent of new Facebook profiles from 2012 to 2015 are from the ages of 45-54. While on the other hand, there has been a 25% decline during the same period for new Facebook profiles of people aged 13-17 in the US. Facebook has 1.65 billion monthly active users. There’s no social platform even close. Snapchat has over 100 million daily users. Snapchat has managed to create impressive engagement with disappearing content, but it’s still not easy to beat Facebook, which has turned into a daily routine for many of its users. According to comScore, active users spend an average of 30 minutes a day on Facebook. No social network comes close to that. Snapchat has the edge over the Instagram app by over a minute. Furthermore, Snapchat claims that 54% of its users engage with the app daily. 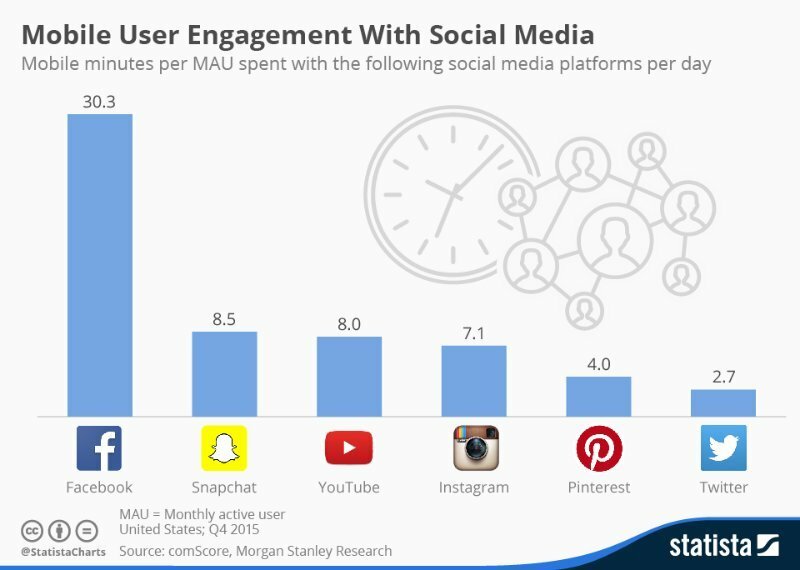 With that said, currently, Snapchat has the slight edge when it comes to time spent on the app. With the reach and money of Facebook, I have little doubt Instagram Stories will catch up to Snapchat very quickly regarding being the go-to app for disappearing content. Thanks to Mariale for creating such a great featured image! As The New Yorker suggested, “is the expiring highlight reel more than a shameless grab for one of Snapchat’s core features or is it a response to a demand: on the Internet that always remembers we are fighting for places, we can go to forget? 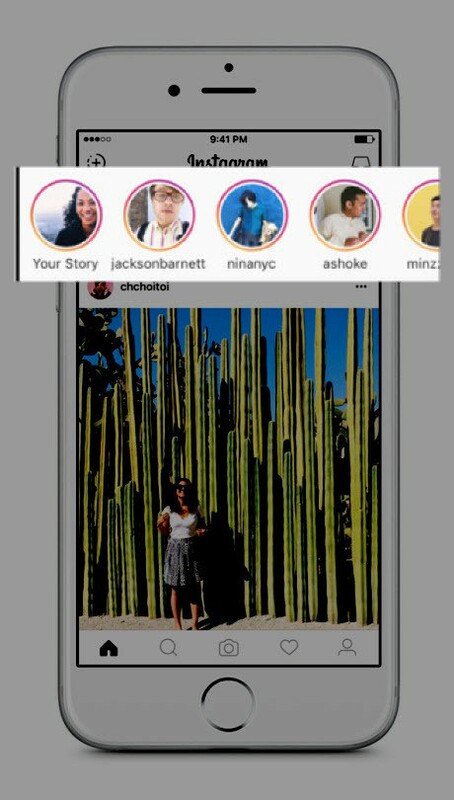 What’s your opinion on Instagram Stories? We’d love to get your feedback!